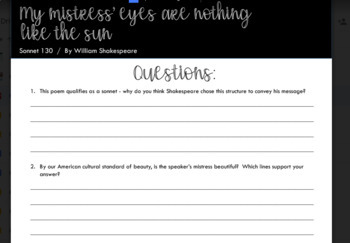 Sonnet Introduction: Shakespeare's "My Mistress' Eyes Are Nothing Like the Sun"
Getting ready to teach a Shakespeare play? 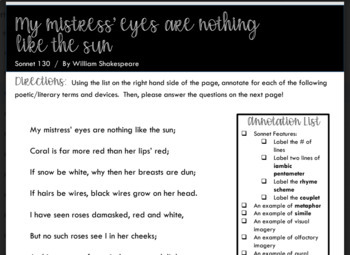 Looking to review the structure of a sonnet in a fun, tech-savvy way? Here's a quick one day lesson and homework assignment that will do the job! 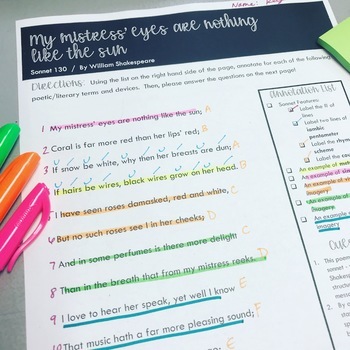 Students will listen to the poem "My Mistress' Eyes are Nothing Like the Sun" and then, working in partners or small groups, tackle a specific Annotation Checklist for all of the features of a sonnet. 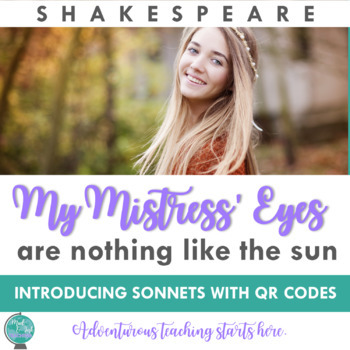 For groups and students who are unfamiliar with sonnet terminology, this product offers four QR codes to print and display that students can scan to support them in their exploration of the poem. After examining the basic principles of a sonnet, students then move into answering four analysis questions about the poem itself. Finally, I've included a Write Your Own Sonnet EDITABLE homework assignment that you can share with your students. Challenge them to try one on their own!